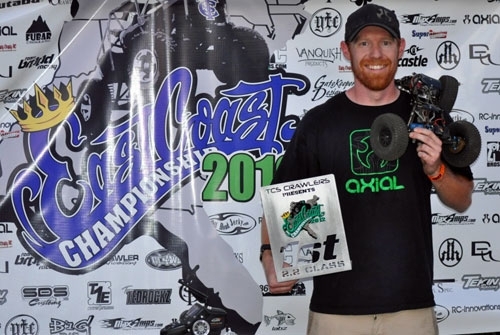 Team Axial driver Jake Wright made the long trek down to Alabama from southern California with his XR10 for the 2012 East Coast Championships, aka ECC. ECC usually brings in drivers from all over the US to compete for the east coast crown. 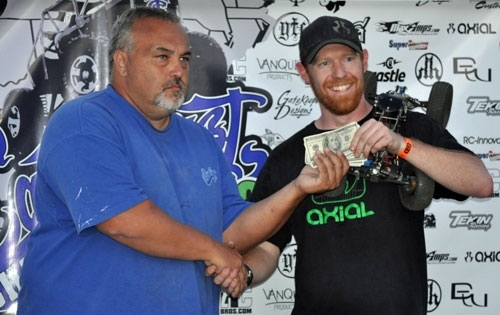 After a long hard fought battle with talented drivers from around the country, Axial’s very own Jake Wright managed to take the win and the cash prize back to California with him. Congrats Jake!! We are proud to have you on the team!! Photos courtesy of Ryan Bean. 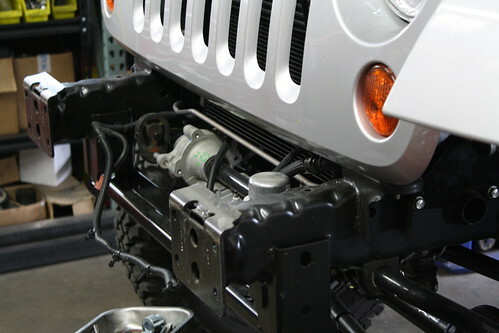 As we continue to build up our 2012 Jeep Rubicon we couldn’t help but notice the online buzz about Easter Jeep Safari in Moab, UT. The entire Rebel Off Road group were preparing their Jeeps for the event whilst putting time into our SCX10JK project. 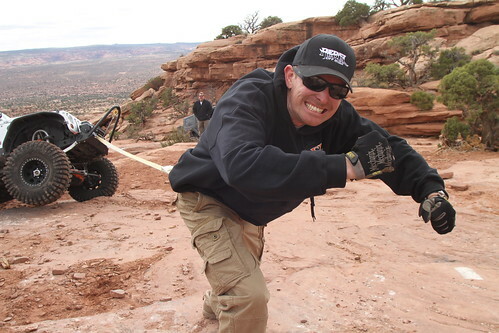 We decided that there was no better place to test our Jeep’s ability than to hit the world famous Moab rock trails. 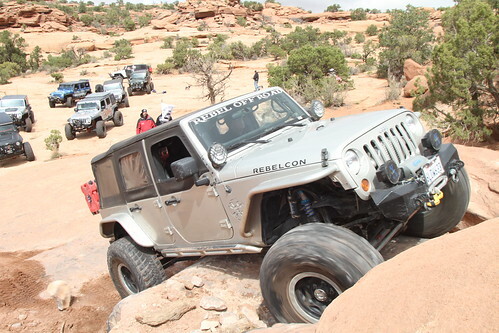 Moab has long been considered a Jeeper’s paradise, with roads that stretch hundreds of miles allowing people to enjoy some of the most beautiful scenery in the USA. Our “SCX10JK” wasn’t completely finished (is any rig ever really finished? 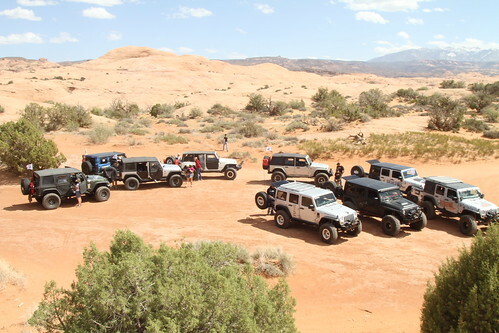 ), but we figured it was in a state of completion that would suit traveling the world famous Moab trails, hopefully without drama. 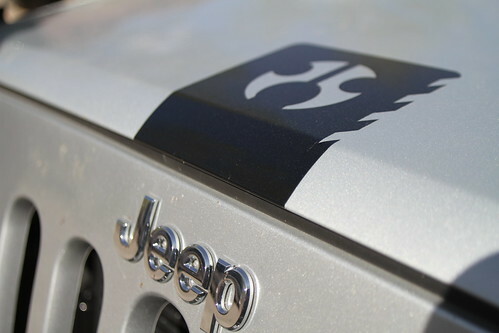 We requested some time from our internal graphics master Scott Roberts to whip up some art for the JK. He was extremely busy with Axial day to day operations, so we requested that he keep it simple and clean. We wanted to make sure our partners had a little exposure on the side of the Jeep as well as adding a little character to our rig. Scott whipped up some nice simple graphics for us and took the time to install them over at Rebel Off Road. Thank you Scott! The first spot we hit was Hell’s Revenge. This particular trail is strange in that you drive your vehicle on a literal sea of rock. You simply follow the rubber marks from past travelers and negotiate a rollercoaster of winding trails. This place has a surface unlike anything I have ever seen. They call it slick rock, but the reality is… it is anything but slick. 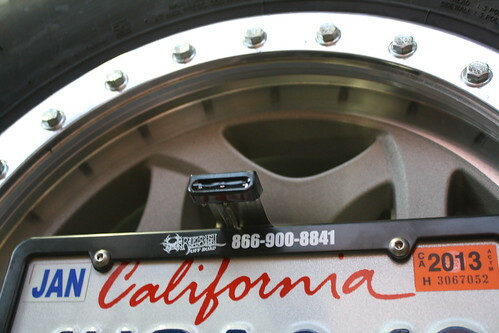 Instead it is like sandpaper and offers a tremendous amount of grip. It is possible to walk up near vertical faces in your plain old skate shoes! Bond from Rebel Off Road was our fearless leader on this run, he and his entire group of Jeepers are all awesome people to roll the trail with. 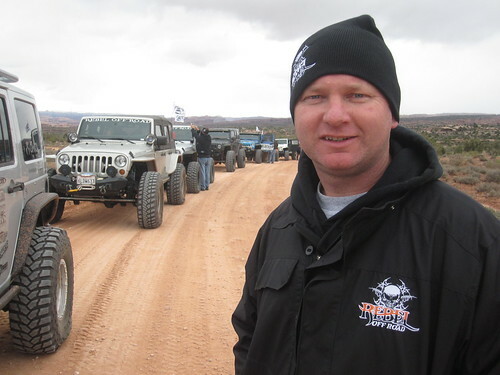 My ride for the trip was with Jason from Rebel, this Jeep is so awesome!!! Here we are stopped for lunch! The next adventure we went on was on a trail called Metal Masher, this has to be one of the most beautiful places I have ever been! 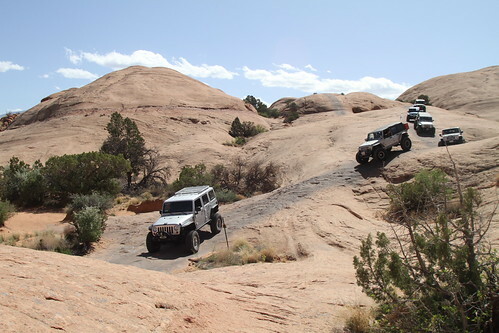 This trail winds up the side of a mountain and eventually takes you to a plateau overlooking Beautiful Moab, Ut. Bond always makes the rounds to discuss what the trail has to offer and makes sure everyone is fully prepared for adventure, Thanks Bond! Bond and his extremely well prepared JK always takes the bonus lines! Some of the dry waterfalls and steps you get to drive up on this trail are absolutely amazing!! 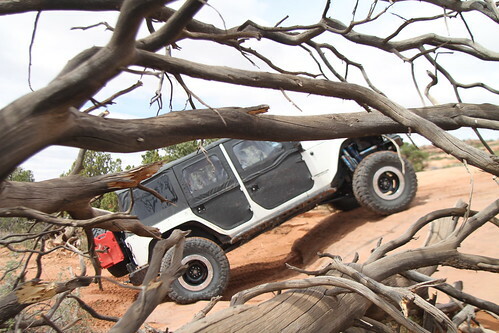 This trail is loaded with optional more challenging lines; this was one of those advanced lines, amazing what these Jeeps are capable of! The Jeep experience is really cool. When the group reaches an obstacle, they all gather around and watch each other give it a shot. It is awesome to see so many people work together to make sure everyone enjoys their experience! The terrain of this place is mind blowing!! Rolling through beautiful Moab with a group of likeminded enthusiasts is surreal, as is the capabilities of this rig, JR… You have a sick Jeep my friend!! Every time we would stop for an obstacle, the Axial RC rigs would come out and offer the youngsters a chance to get some of their own crawling done! 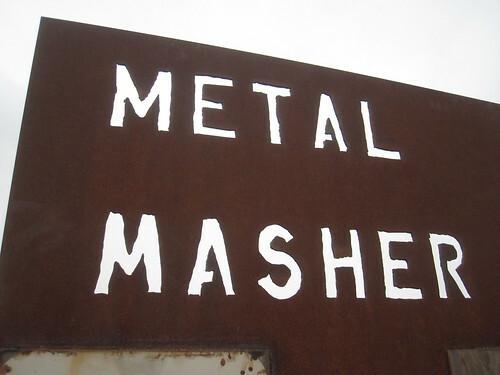 To learn more about Metal Masher click here. 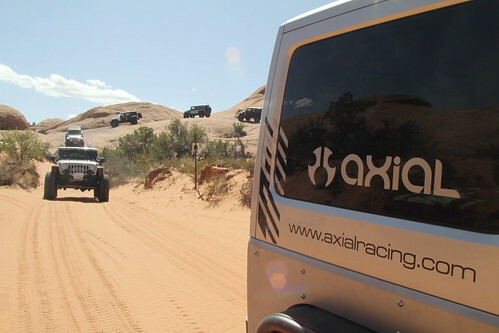 We have successfully put the Axial “SCX10JK” through its paces, and as projected, it performed flawlessly! 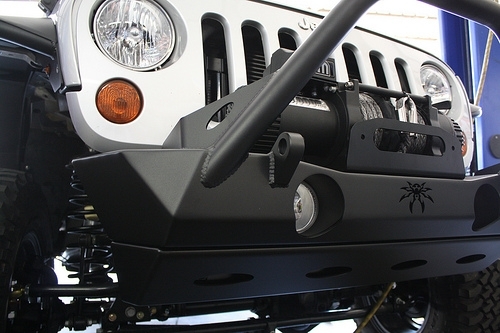 The combination of parts we selected to arm this JK for battle, were absolutely perfect! 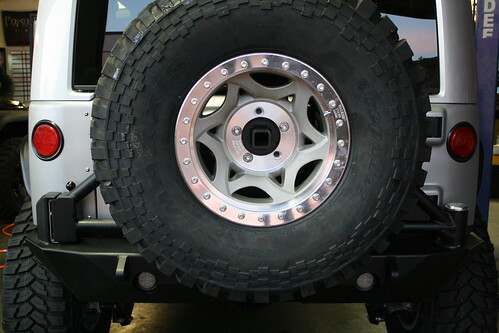 The body protection from Poison Spyder did its job, only experiencing minor scrapes, the wheel and tire combo from Walker Evans Racing and Maxxis offered tons of strength and traction, the Suspension system from Icon flexed when needed and offered excellent ride quality both on road and off road. The Spicer equipped drive shafts propelled us to incredible places, the crew at Rebel Off Road did a tremendous job preparing the JK and guiding us through some of the most incredible terrain on earth! You will have to wait to get a report on the TJM winch and recovery equipment, as of yet, we haven’t had to use it! We have been spending an awful lot of time over at Rebel Off Road lately, and who can blame us? All of us Axial RC guys look at this shop like our hobby shop. These guys are constantly working on cool projects. 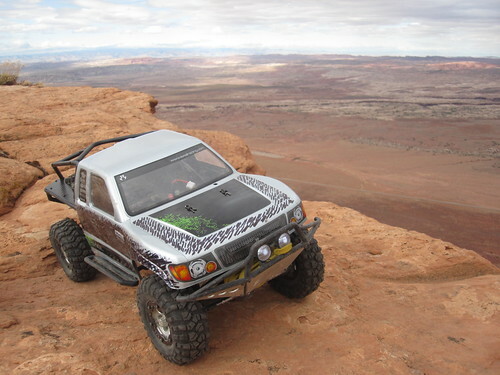 Lucky for us, the SCX10JK is at the top of their priority list. 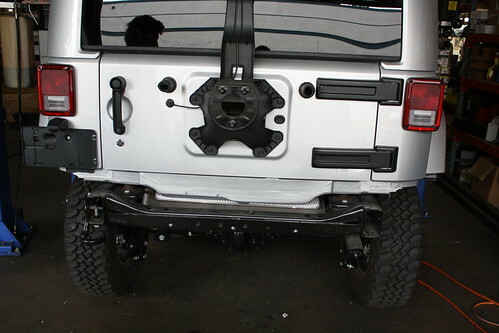 Jason over at Rebel gave us a call letting us know they were in the midst of installing the front and rear bumpers, so we had to roll over and check out the progress…. 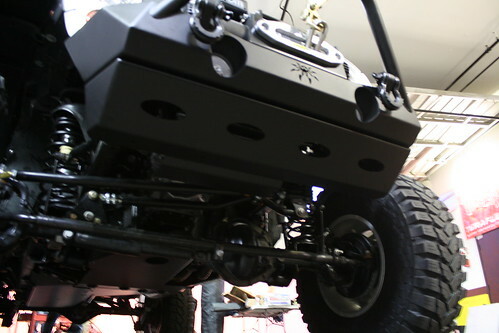 Now that the bumpers are off it is time to start installing the Poison Spyder equipment. 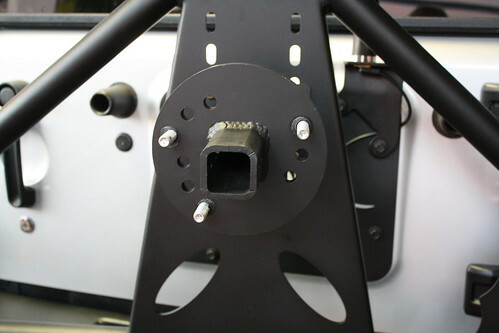 Rebel started with the front bumper and skid plate. 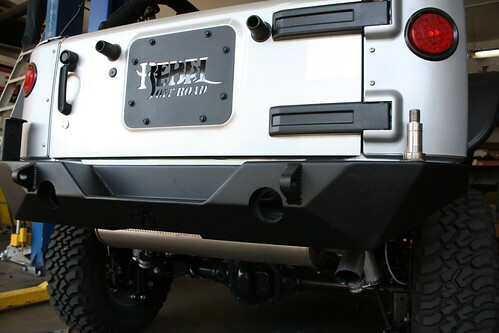 Rebel sent the bumpers out to have them powder coated in a black to match the fenders and sliders. 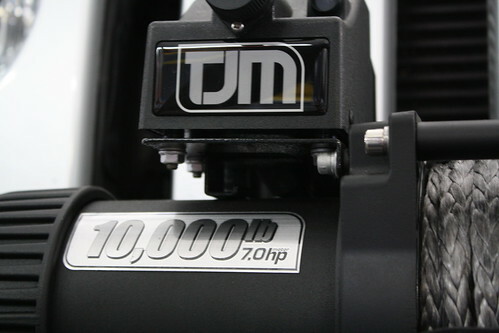 Of course the team at Rebel installed the new “Stealth” series 10,000lb 7 HP winch from TJM. 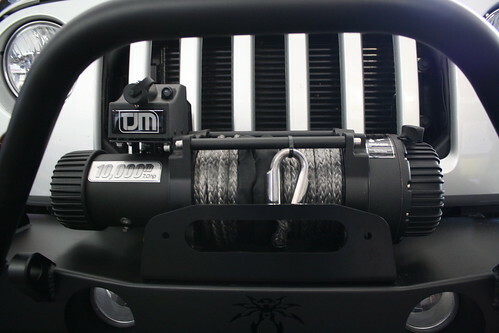 this winch is all new, and ready for extreme duty! The final product is awesome! 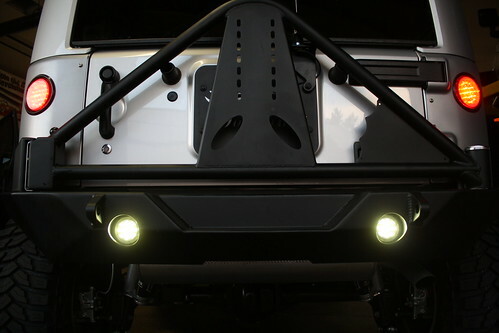 The Poison Spyder Brawler Lite bumper offers a significant improvement over stock allowing for an increase in approach angle, as well as leaving both front tires completely clear of any bumper, so those moments where a front tire must climb a vertical face there is nothing standing in the way! 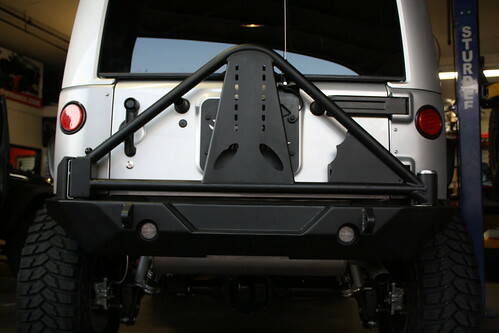 The RockBrawler rear bumper and tire carrier was next on the Rebel priority list. 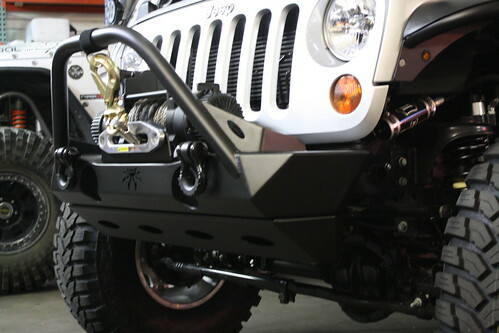 This poison Spyder product, just like the other components were powder coated in a semi-gloss black before installation. 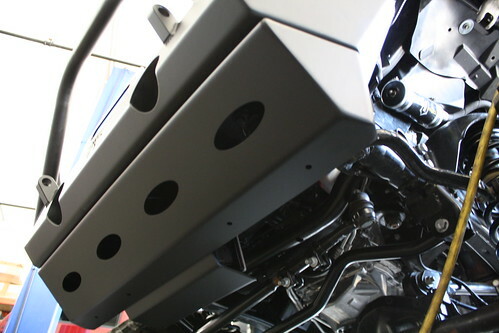 The first portion of this process involves installing the main bumper blade. This is a relatively simple process and is completely bolt on. 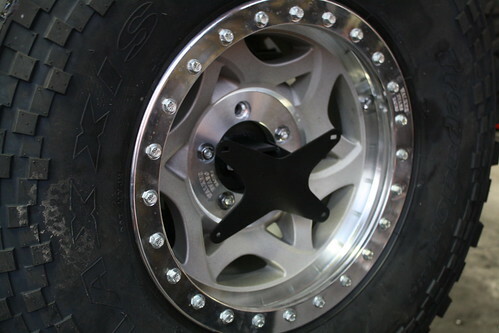 The carrier itself will hold a full size spare, and eventually a TJM hi-lift style jack. 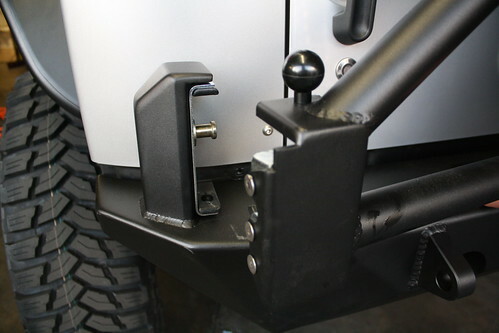 The latching mechanism is genius, it shuts and locks like a car door, so there will be no accidental swinging open! 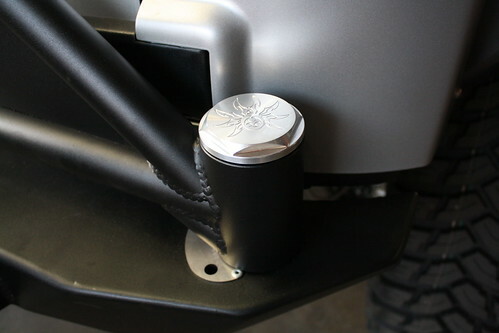 The spindle is covered by this awesome billet aluminum cap with the Poison Spyder logo on it, a little bling!